Two matching drinking glasses produced to commemorate the Dutch European Cup victory of 1988. All inscriptions and illustrations are in orange. One side of the glass depicts an heraldic lion with the inscription: "Nederland Kampioen E.K. '88" The other side shows a soccer ball in full flight with below it the results of the various matches played on the way to victory. 4161 - One of a set of 10. This mug carried the Netherlands coat of arms. The other 9 mugs depict provincial coats of arms. The Netherlands coat of arms of two lions holding a shield surmounted by a crown and depicting a lion rampant. A banner below carries the Dutch Royal Motto "Je Maintiendrai". (I shall persevere). 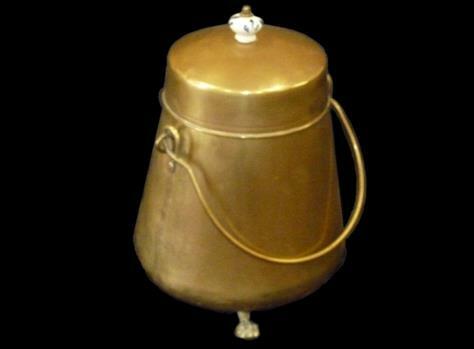 A brass, pear shaped container with handle on three short clawed feet. The lid has a Delft blue porcelain knob. A small plywood and plastic windmill with a music box connected to the vanes. The outside is decorated with windmill scenes. These lamps were essential in Dutch household to help to create the famous "gezelligheid" or cosy atmosphere. Although this seems to have been a windmill only to begin with, with the electric light added later, it speaks of the significance of this type of lamp in the homes of the Dutch. 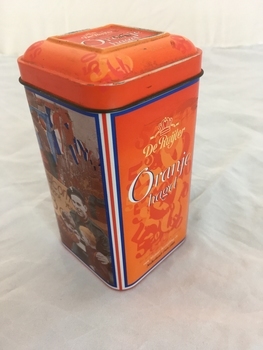 The tin is decorated with images of De Zaanse Schans - an area in North Holland famous for its wind mills. The lid has an image of windmills the main one of which features decorated vanes. Decorative hat from silky type silver, gold, blue and aqua material, finished of with bells at front of hat (see picture - also see items 6351 and 6352). Carnaval is an important annual event in the Southern Provinces of The Netherlands, with each village often having its own Carnavals Club and traditions. 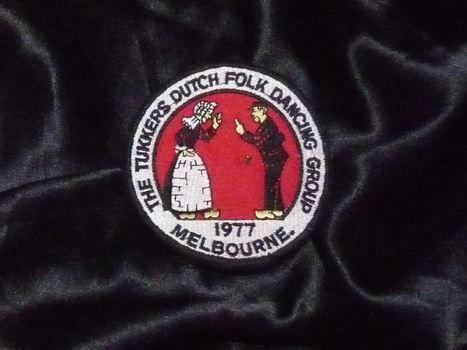 The Dutch People coming from the Southern Provinces continued in many cases this tradition and formed their regional Carnavals Clubs in Australia. Each Carnalvals Club has its own colourful uniforms, including a hat. There are potentially three types of hats: A Formal Hat for official events, a Work Hat for use during normal club nights and for those members lucky enough to be for a year chosen as the "Prince" of the club, a Prince Hat. For people from the Southern Provinces of the Netherlands, Carnavall is an important cultural event. 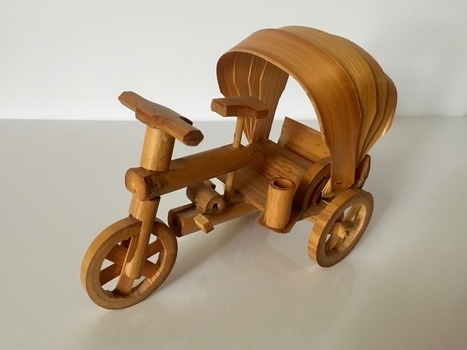 A small but faithful bamboo replica of the three-wheeled mode of transport known as a cycle rickshaw. Wire has been used to construct a kind of axle that joins the two pedals via a small bamboo tube below the cycle's crossbar and the seat. Although the pedals can be turned this is not an option for the wheels which are firmly glued. The item most likely originates from the former Dutch East Indies where this mode of transport is still available though now supplemented with auto-rickshaws. 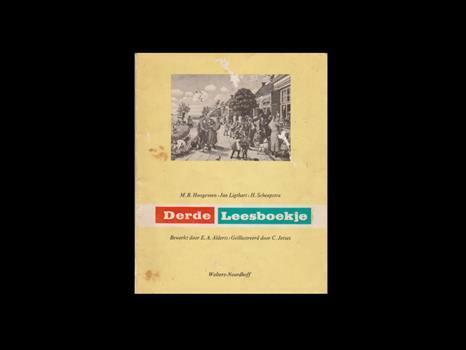 The item hearkens back to the years of Dutch occupation of what is now Indonesia and the fact that many Dutch lived, worked and felt at home there. On the back the rickshaw displays registration number 3947. This seems to have been applied with a stamp pad. Brass miniature coal shuttle with copper body and Delft blue handle. Light timber square box with hinged lid. 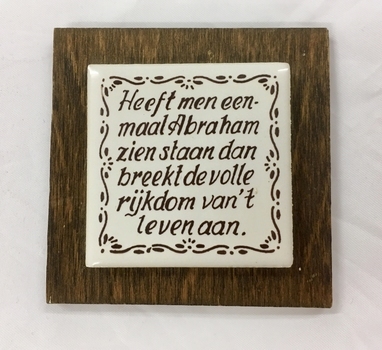 Lid: first line of popular song relating to place this box commemorates, viz den Bosch (s’Hertogenbosch) capital of province Brabant. Same line repeated on two sides of box. Illustration on lid shows male and female figures, female with basket. Panel of cream cotton with blue cross-stitch embroidery of Dutch scenes. Molen (windmill), Schaatsen (couple skating), Vissers (fishers), Wasdag (washing day). Suspended from wooden frame with brass rod and chain for hanging. 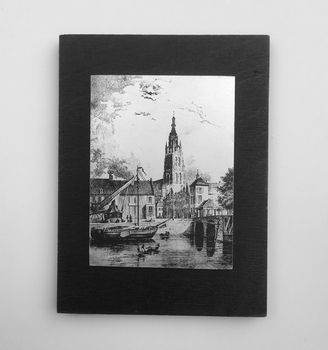 (a) and (b) - A set of two ceramic wall tiles featuring historic buildings in the town of Heemstede in the province of North Holland. The images are in shades of blue. 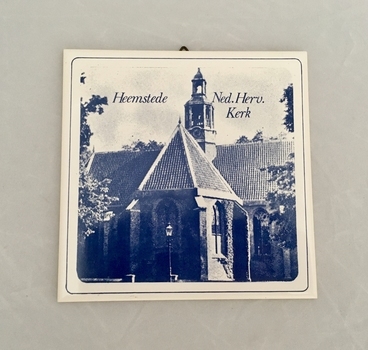 Tile (a) depicts the Dutch Reformed Church building (Netherlands Reformed Church). Tile (b) is an image of the Cruquius Museum on the site of a one-time pumping station. On the back of each tile are the words Mosa Royal Holland. Tile (a) also has the numbers 86 and 89 imprinted. Scalloped-edged shallow ashtray with three cigarette rests and a pair of tiny clogs on the edge. Upper edge decorated with blue arrows, three floral motifs inside bowl, rural scene with windmill on on bottom of bowl. 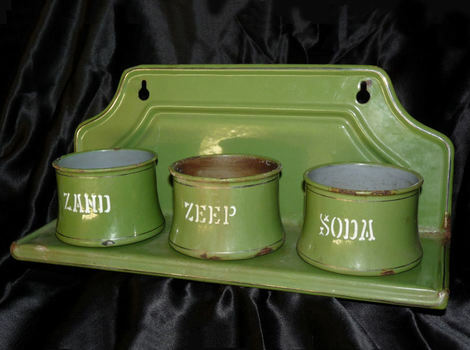 Dutch were formerly heavy smokers, and many brought ashtrays as part of their luggage when they migrated. On underside: superimposed with crown, handpainted in Delftsblauw, 119. 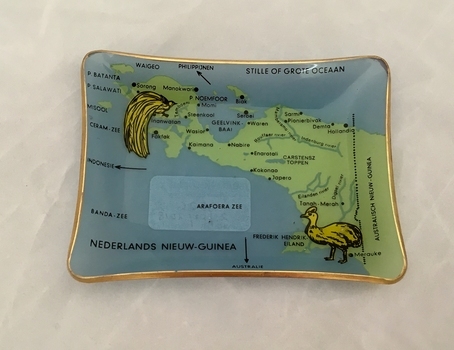 Richly illustrated small rectangular glass ashtray showing map of one-time Dutch New Guinea, surrounding waters and smaller islands. Two endemic bids are also shown. The glas is a pale blue; the illustrations are in green and yellow; words are in black. The ashtray's four sides are curled slightly upwards. The item dates from the years of Dutch influence in the region which ended in 1962. The region is now known as West Papua. As the above urls will show, West Papua's history is a complex one with various colonial powers disputing ownership with the local inhabitants. Modern Indonesia also lays claim to it. The area was part of the Kingdom of the Netherlands from 1949 till 1962. Prior to 1949 it was part of the Dutch East Indies. 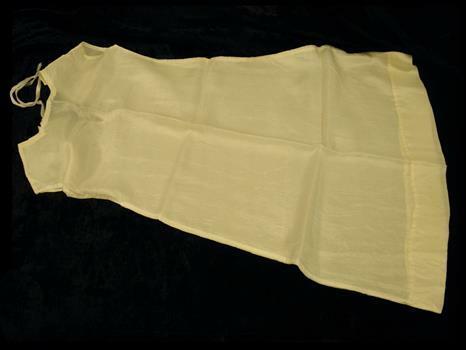 The item may well date from this pre-1949 period. Oceans, seas and islands are named in the Dutch language. A dotted border marks off Australian New Guinea. 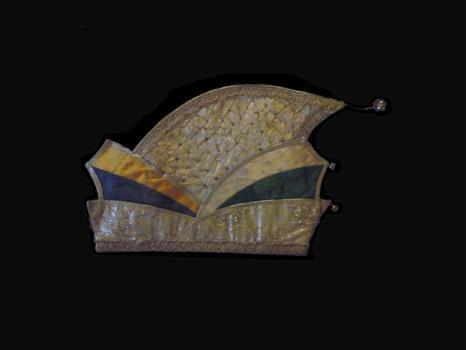 Small brown wooden shield with a plastic medallion in black, yellow and gold. The 1883 date refers to the establishment of the Royal Dutch Cricket Association. Represents a link between Anglo-Dutch sporting connections. 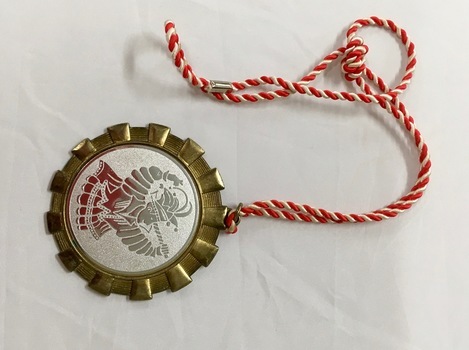 Circular medallion displaying two crossed cricket bats in front of a wicket with a crown above them. Below this is the date "1883" and along the bottom half is the name of the association. Rear has a mounting hole. On back of shield is a sticker which names the manufacturer of the shield. Miniature brass souvenir iron of the type able to contain glowing coals when full size. Pewter; circular with a rose petal edge. Refers to the 25th anniversary of the reign of Queen Juliana of the Netherlands. Shows fondness/affection of the Dutch public to their royal family. Simply produced paper item celebrating the wedding of Willem Alexander and Maxima which took place before he became King. The main section has been selected - the remainder folded behind and the result placed in a wooden frame. Their portraits are enclosed by a heart-shaped orange ribbon. A red, white and blue flag with orange pennant and an orange flag are on the opposite side. Both parts of the illustration are surmounted by a crown. Crown Prince Willem Alexander of the Netherlands married his Argentinian sweetheart Maxima Zorreguieta Cerruti in February 2002. Rectangular tile depicting a leafy tree loaded with oranges. Under it are four young people - two male and two female. The main colours are green on a greyish background. Orange accents appear throughout the clothing. Princess Juliana and Prince Bernard married in 1937 prior to the Princess becoming Queen in 1948. 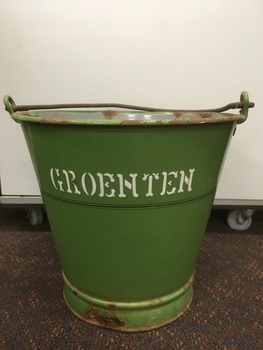 The fact that this item was brought to Australia with a migrant family indicates the affection in which the Royal Family was held by many Dutch people. An orange banner reads 1937-1962. 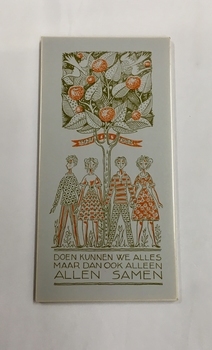 Below the illustration is the motto: "Doen kunnen we alles maar dan ook alleen allen samen." (We can do everything but only together). On the back are various imprints relating to the maker Mosa Holland. Rectangular box containing blue plastic insert. Counters, cards, wheel, other game elements. On lid, illustrations of game contents. On left lower corner, 1978 by Hausemann & Hotte NV under Berne Universal Copyright Conventions. Lower right corner, red elephant Jumbo. Bottom of box gives instructions for game in 7 languages.